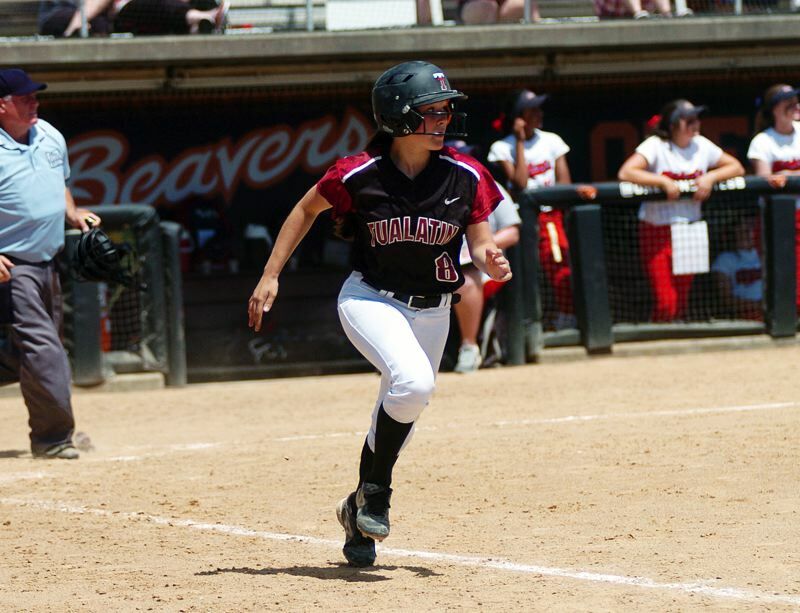 CORVALLIS — Back in 2015, Taylor Alton was a freshman on the Tualatin High School softball team that scored a 10-0 win over Westview in the Class 6A state championship game. That's definitely quite a way to start a high school softball career. Now, three years later, Alton has a chance to finish that same high school career in amazing fashion. Alton, and her Timberwolf teammates, will vie for another title when they face Clackamas in the 2018 Class 6A state championship contest, set to start at 1 p.m. Saturday at the Oregon State University softball complex in Corvallis. "It's amazing. I can't even put it into words," Alton said Tuesday, following the Wolves' 8-5 win over Oregon City in a state playoff semifinal game played at Tualatin High School. "I was able to go in and start my freshman year that way, and then, to end it that way as a senior, it would be amazing." Tualatin, the Three Rivers League champion, the No. 1 team in the final OSAA power rankings and the No. 9 team in the country, according to the latest USA Today Super 25 rankings, brings a perfect 29-0 record into Saturday's title contest. Clackamas, the Mt. Hood Conference champion and the No. 2 team in the OSAA power rankings, is 26-5 on the season. "We have to show up and have confidence," Tualatin senior pitcher Megan Woodward said. "If our bats show up, then that's all we need." The Tualatin and Clackamas teams have already met once this season, with the Wolves scoring a 6-2 win in a game played back on March 19 at Tualatin High School. 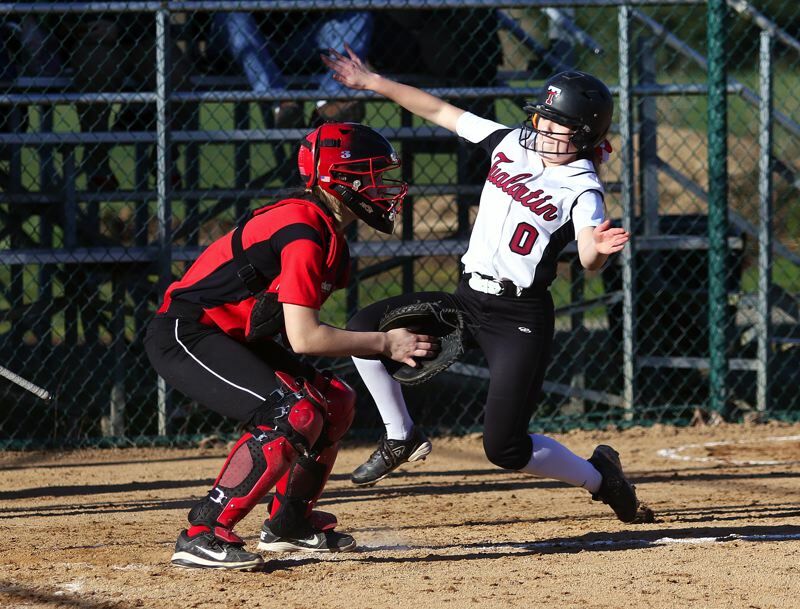 "We've seen them before," Tualatin catcher Ella Hillier said. "They know us, and we know them, so we'll have to bring our best game, and hope to go out on top." "We have to come out strong, and we have to know that they're going to come out strong, too," Tualatin sophomore outfielder Tia Ridings said. "We have to know that we're more than capable." The Wolves certainly have seemed to be capable all season long, as they look to become the first "big" school team to go undefeated on the season since Churchill went 23-0 in winning the Class 4A state championship back in 1992. "We knew that we were going to have a good season, but we didn't know it was going to be this good," Ridings said. "We really worked hard for this." But Saturday's game could be a battle. Clackamas has scored at an average of 10.3 runs a game this season, which is second best among all Class 6A teams. Meanwhile, Tualatin has given up just an average of 1.6 runs a game, which also ranks second among all Class 6A teams. "They have a really good offense, and I think we have an ever better offense and defense," Alton said. "So, I think we can't go in overconfident, but I think we have the edge, and we can take home the state title this year." But, no matter what, the Tualatin team — especially the five seniors, Woodward, Alton, Zoe Olivera, Kayla Laird and Hillier — are looking to cherish their final game together on the diamond. "This has been the best season," Woodward said. "I feel so grateful to have a chance to play beside all the other seniors. We've been blessed." "It's really cool to have this season year, and it's an experience you won't forget," Hillier said. And then there's Alton, looking to be part of a state championship team for a second time. "I was there my freshman year, and to come back and have the chance to do it again as a senior is the best feeling I've ever had," said Alton, who drew a walk and scored a run in the 2015 championship game. During the Wolves' win over Clackamas early in the season, Olivera went 3 for 3 at the plate with a pair of runs scored. Alton doubled and drove in two runs. Woodward and Ridings combined to pitch Tualatin to the win. For Clackamas, senior Kylee Vanderbout went 2 for 3 with a run scored. Where have we come from and where are we going? This article brought to you courtest of Stan Robinson of Pacific West Roofing, Insider roofing Expert.